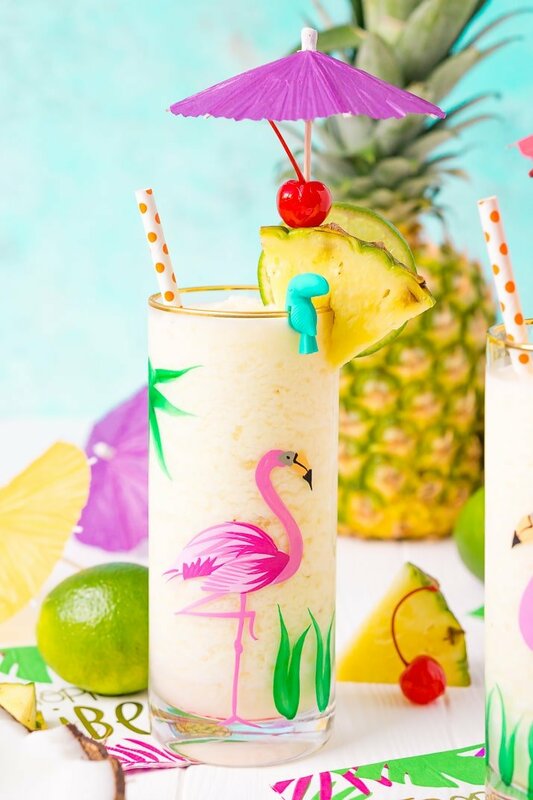 This Pina Colada recipe is a deliciously fruity and frozen drink made with creamy coconut and sweet pineapple and zesty lime juice. Add rum to make things lively or keep it virgin for the whole family to enjoy! 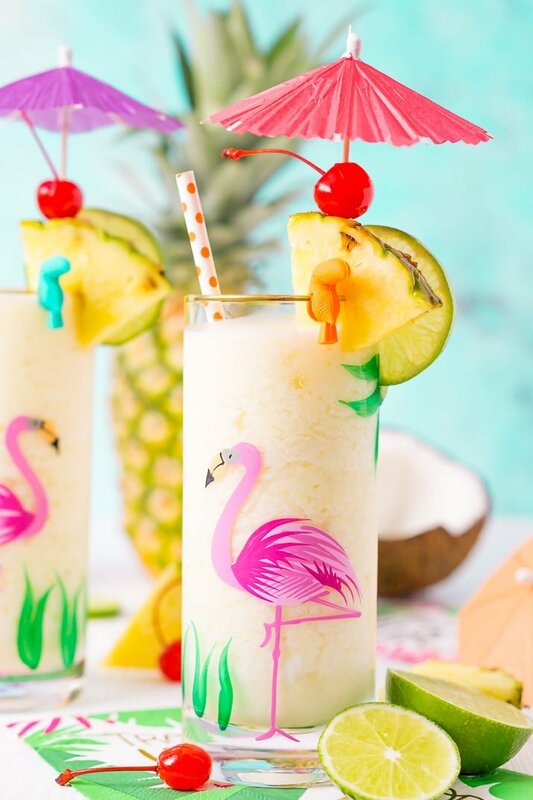 If you like Pina Coladas… you’ll want this recipe! And I bet that song is totally stuck in your head now, isn’t it? Sorry. I can never resist a good Pina Colada, in fact, it’s was the first legal drink I had when I turned 21. That might sound pretty cliché, but let’s face it, they’re tasty! And when it comes to beach vacations like my recent trip to Fort Myers Beach, a Pina Colada is exactly the kind of drink you want. A frozen, fruity, and delicious cocktail that’s perfect for the beach! 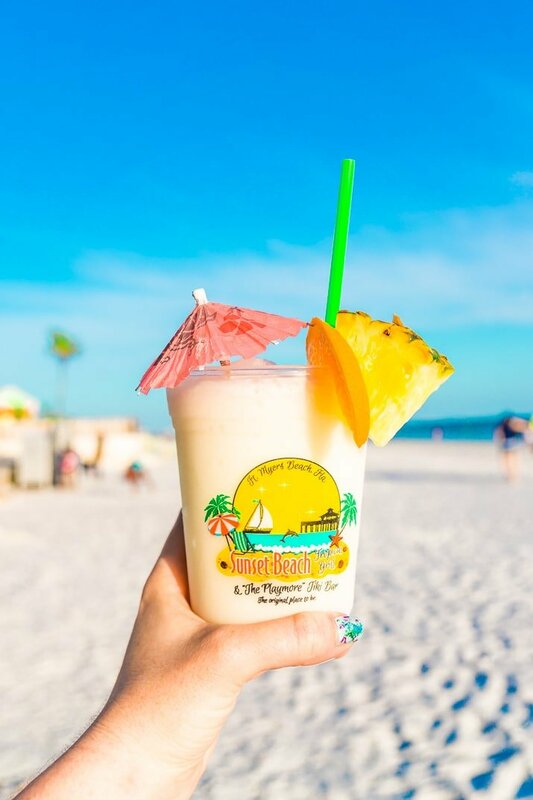 When I was in Fort Myers Beach we had dinner at the Sunset Beach Tropical Grill and their pina coladas were delightful, or at least the virgin ones were because… pregnancy, but I’m assuming a good dose of rum would only make them better. 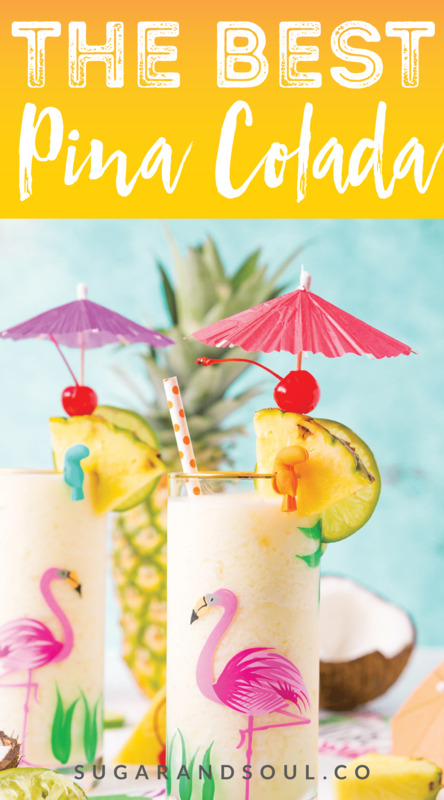 It also reminded me that I have yet to share my easy pina colada recipe with all of you, so here we are! Traditionally, this cocktail is considered to be a bit “girly” but it can pack a serious punch depending on how much rum you add to it. I generally just use coconut rum in my recipe, but feel free to choose the rum you like most, just know that it will change the flavor slightly and will likely make it less sweet. What’s In A Pina Colada? Traditionally, this sweet frozen cocktail is made with rum, coconut cream or milk, and pineapple juice. But personally, I think there’s a better way to make it. This way! In this recipe, you’ll still find the coconut cream, but instead of juice, we’ll use frozen pineapple. This will add more flavor to the drink and will keep it thicker longer. I also like adding a touch of powdered sugar or simple syrup and a squeeze of lime juice for a super tropical flavor. This is a really easy drink to make! You simply just have to add all the ingredients to a blender (this one is my favorite) and blend until thick and slushy. The garnishes are where you can have fun! I like using a pineapple wedge, slice of lime, and a maraschino cherry. And don’t forget the drink umbrella and serve them in flamingo cups for extra fun! DO NOT use canned pineapple chunks instead of fresh or frozen. They have a lot of extra liquid in them even when drained and this could impact the consistency of the drink. Pro Tip: Blend your ice first and transfer to a bowl and the freezer. Then stir it into the mixture after you’ve blended the rest of the ingredients together. This will help keep your drink frozen longer. This is a really easy drink to make non-alcoholic so it’s perfect for kids, pregnant women, and others who don’t drink alcohol. Simply make the recipe and omit the rum, it’s that easy! Fill the blender with ice and blend it into a powdery snow, transfer to a bowl and place in the freezer while you make the rest of the drink. Add the pineapple, coconut cream, lime juice, coconut rum, and simple syrup to the blender and blend until smooth. Add 1 1/2 cups of the powdered ice to each of two large glasses, divide the liquid mixture evenly among the glasses and stir to combine. This is my kind of summer drink! Perfect for warm nights or hot afternoons! I love this one! 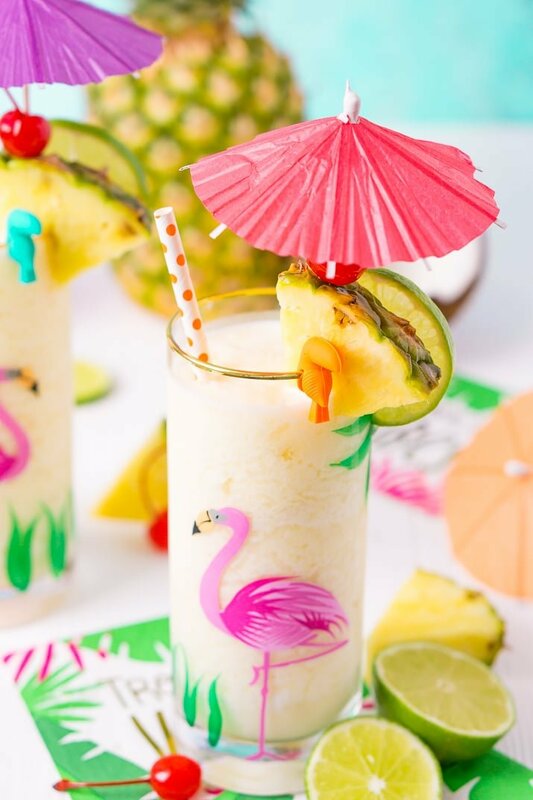 Your pina coladas were perfect over this hot holiday weekend!!! I’ll be sipping on these all summer long!